LESS 2.7.1 compiler for Komodo Edit/Ide. This addon gives you the ability to compile Less files and gives a improved auto-completion of Less variables (also includes imports). If you install this addon. 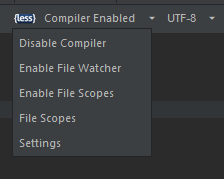 default the compiler is enabled. 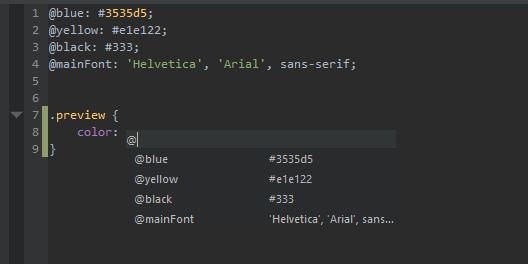 When you edit a LESS file the file will be compiled to a CSS file. If you have imports in you're Less-file or you want to run multiple output-files. 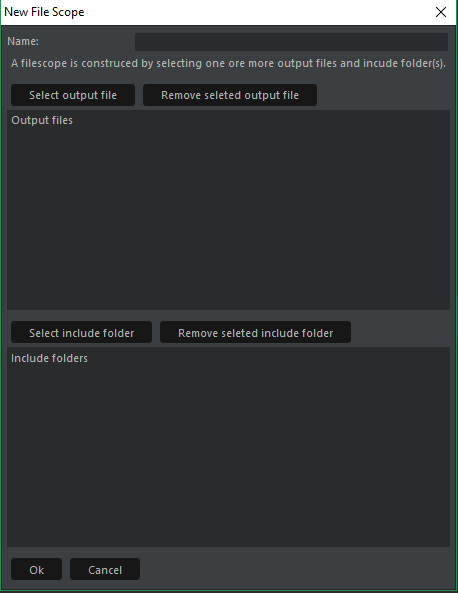 You need to use a file scope this enables you to set up project based file scopes, that will trigger output-files based on output-files and include-folders. If you want to compile a file on the fly that has includes, you can also set up a single file watcher. This will trigger the selected output-file regardless of the Less-file you're working on. Trough the Tools-menu and file context-menu are Less menu's added, that allows you to trigger file based commands and a few commands concerning file-watchers, file-scopes and auto-completion commands/settings. Also is a status-bar added to the breadcrumb-bar that also has a context-menu that allows you to control various commands/settings. When editing Less files, a Less status bar will be shown. The status bar well tell you, if the compiler is enabled/disabled, if a file watcher or file scope is active and it will show errors if present. Trough the status-bar you can easily configure the settings. This will enable/disable the compiler. 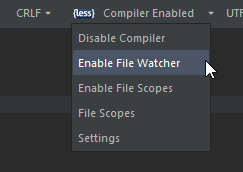 This will enable/disable a file watcher for the current file, when you edit less file's only the "Watched file" will be compiled. This will enable the "file scopes" mode, that will trigger file scopes based on projects. 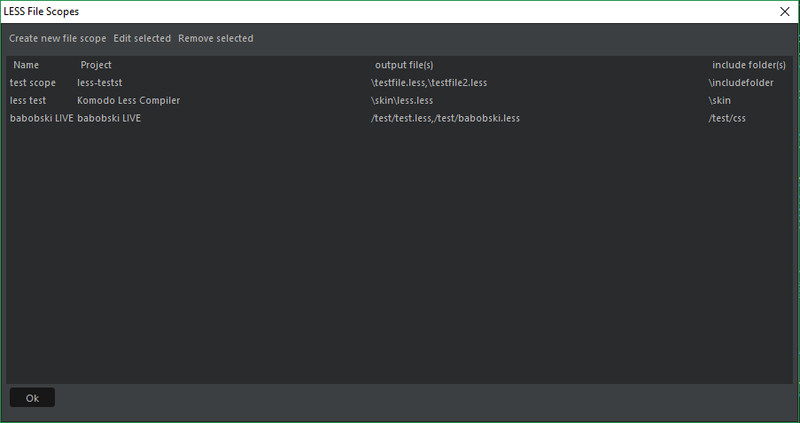 This will open a window where you can set file scopes, so you can work with multiple output files in one project or work with multiple projects. This will open the Less-settings window. This addon will provide you with a LESS variables auto-completion. The vars will be search automatically( on file open and after you pressed @ on save ). You can also trigger the search trough the menu. When you type @ a auto completion box will be shown. This will open the settings window. File-scopes allow you to work with output-files and include-folders, these file scopes are set on a project level. When you edit a file in the include-folder(s) the selected output-files(s) are triggered. In this window you can create you're project based file scopes, you can have multiple file scopes in one project. You can select multiple output-files, but is not recommended to use more that two output-files for performance reasons. If you want to edit a Less-file that has includes, on the fly. You can set up a File watcher, when you enable the file Watcher the current file will be added as output-file. When you now edit Less files only the output-file will be triggered.